Although not everything went as planned (inbound shipping was a nightmare), we still had a great experience talking to more than 130 people about print on-demand color labels and corrugated. Here are 3 “Ah-Ha’s” I took from our experience. 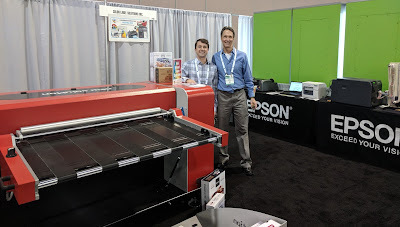 First, our Sales Manager, Grant Lapke did an outstanding job installing, running and packing our NS Multi printer. Although we shipped this machine a great distance, the print quality was still outstanding. Just look at this box printed with the NS Multi. Or our signs we printed as our backdrop arrived late to the show. I’ve written about the print quality before. 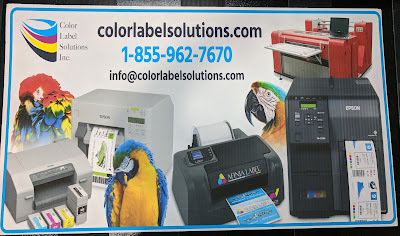 http://colorlabelsondemand.blogspot.com/2018/03/ns-multi-print-quality.html. But given the shipping, I was impressed at how well Grant got this printer to produce outstanding quality. Given the print quality, we spoke to several companies about printing instore merchandizing displays. 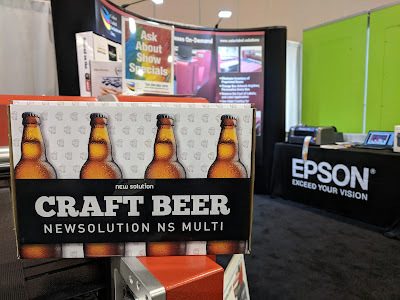 The NS Multi would enable large, package good companies to produce personalized displays and end caps quickly. And with the Caldera’s RIP capability for variable data and images, companies would be able to personalize each end cap uniquely for the store. The capability of the NS Multi to produce unique and high-quality merchandizing is a new opportunity for us and the market. Second, we launched a new semi-automatic label applicator integrated with the C7500. 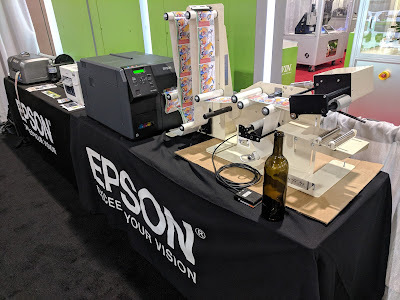 This applicator uses a sensor and a movable arm to manage the “loose-loop” of labels between the printer and applicator. You need this Loop given the fact the printer backs up when starting to print. One feature I found of interest with this new applicator is that you can send a large (i.e. 500) print job to the printer. As the labels are consumed, the sensor in the loop allows the printer to produce more, always keeping the loop filled. So if you had a requirement of a batch of 500, you could print approximately 510-520 labels, and know when the batch was completed. This feature may make this system work better for the operators. If you are interested in applying labels to round and soon flat containers directly from the C7500, contact us. We’ll discuss how you could use this new capability in your operation. Third, we showed again the new L501 from Afinia; which produces beautiful labels. And beginning May 1st, Afinia will start shipping this new product. From my perspective, the L501 fits companies that need to print great looking labels in relatively small batches. The cost of the printer is $3500; and offers both dye and pigment ink. The “Due” Ink Technology aspect is interesting; as dye inks produce generally better colors whereas pigment inks are more durable typically. If you want great looking labels but don’t want to spend a lot of money for hardware, the L501 may be a great option for you. Pack Expo was a valuable tradeshow for us. If you need great looking on-demand color labels, boxes or displays, contact us to discuss your requirements. We’d appreciate the opportunity to learn more about your business. How Not To Kill Your Inkjet Label Printer. 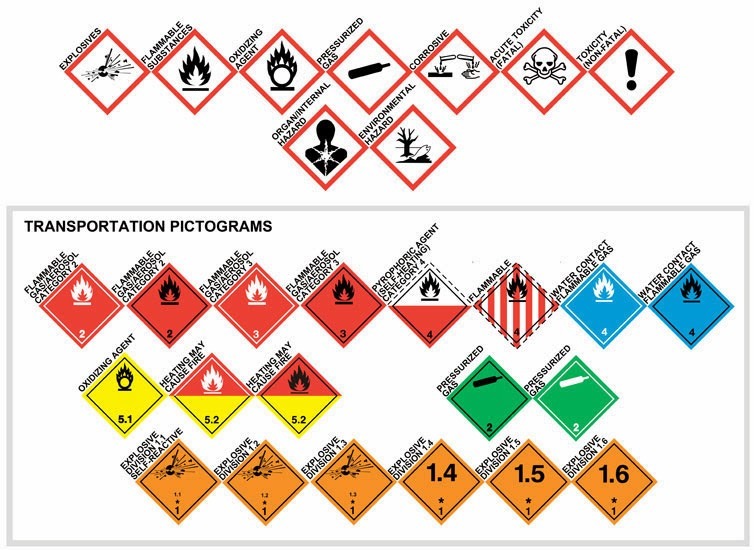 Recently, Tim Semic, our Support Manager, suggested we create a blog on “how not to kill your inkjet label printer”. I thought immediately, “that’s a great idea”. Tim suggested the questions; and we both worked on the answers. This post features answers based on our work with Epson label printers primarily; but the concept applies to label printers based on Memjet and HP as well. OK, I don’t want to kill my label printer, tell me more. The most common hardware problem with inkjet label printers are clogged nozzles. An inkjet printhead has thousands of very tiny nozzles. Memjet claims to have 70,400 nozzles in an 8.77” printhead: https://www.memjet.com/versapass/. These nozzles are all subject to clogging; and thus, ruining your day. What causes print nozzles to clog? The number one reason inkjet nozzles clog is particles carried into the printer on the label media. As this foreign material enters the printhead, nozzles can get plugged. The second reason for clogged nozzles is similar to the first; dust and other foreign material in the air may plug inkjet nozzles as well. The third way inkjet nozzles will clog occurs when the ink inside of the printhead dries. Dried ink inside the printhead may occur when leaving the printer powered off for long periods of time, and/or when the printer is kept in very dry environmental conditions. What are the symptoms of clogged print nozzles? A plugged nozzle symptom will manifest as white lines running across the label print output in the orientation of the printhead. These white lines are a classic symptom of clogged print nozzles. The lines that you see are actually the white label where no ink was applied. The other tell-tail symptom of clogged print nozzles is when your printer constantly goes into maintenance mode. The thin lines you see are from the label showing through due to clogged print nozzles. 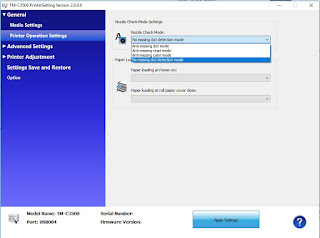 My printer occasionally makes noise when idle and pauses often during printing. Epson Label Printers with an LCD display will show “maintenance" or "head maintenance". Your label printer has a service called Head Maintenance that runs periodically to keep the ink jet nozzles clear, and to prevent them from drying out. This maintenance service works by forcing a small amount of ink through the printer’s nozzles. However, this service may run repeatedly when clogged nozzles are detected. In the C7500, one option is to turn on the “spitting function”; also called “Continuous Printing”. With this setting, the printer “spits” out very small quantities of ink, invisible to the naked eye, randomly throughout the print. Memjet printers have the same functionality. Sometimes the label may appear slightly grey from the ink, even though you can’t see the individual drops without a magnifying glass. We recommend this setting if the tiny ink spots are OK with your print output. The other option is “pause” for maintenance. In this situation, the printer stops occasionally to check the printhead. On the C3500, you can turn off the checking/cleaning function of the printer to save ink and to reduce the number of maintenance kits required. 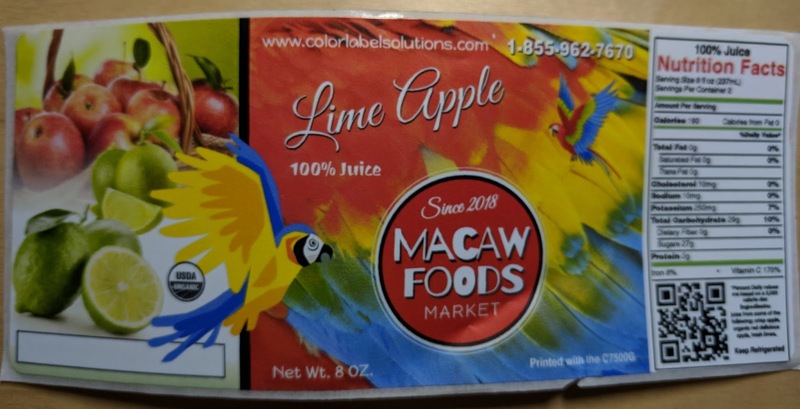 As we print very few labels, we typically run our C3500 with the “no missing dot detection mode” selected; and then clean manually when needed. What can I do if my printer is in a clogged nozzle condition? Performing a manual cleaning is a way to take control of removing clogs in the nozzles. 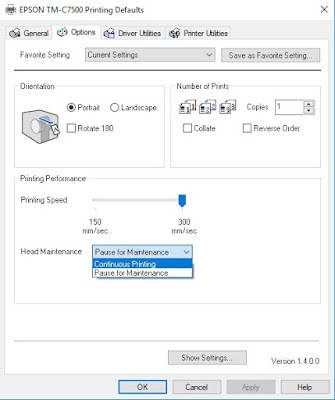 Prior to performing a manual cleaning, it’s best practice to print a nozzle check pattern from the printer utility software. A nozzle check pattern will provide you a baseline view of the problem. 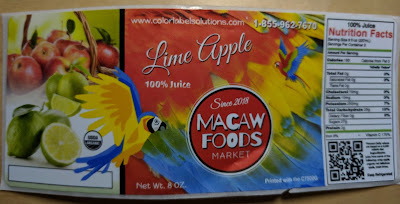 The nozzle check pattern prints lines of every CMYK color and will reveal areas and the color(s) that are being affected by the clogged nozzles. If you see gaps in the nozzle check pattern, the next step is to run a manual cleaning on the printer. After the cleaning cycle completes, you may want print out another nozzle check pattern to look for improvement. You should repeat the cleaning/test pattern cycle until either the clogged nozzles have been cleared, or you no longer see improvement occurring. The manual cleaning didn’t completely resolve the issue. Now what? Once you determine that the cleaning utility is unable to resolve the clogged nozzle condition, the printer will have to be repaired by the manufacturer in the case of Epson or any other manufacturer with permanent printheads. For Memjet printers, you can also attempt to rehydrate the ink by placing the printhead in the shipping cap with distilled water. If the nozzles remained plugged, you’ll need to replace the printhead. How can clogged print nozzles be prevented in the first place? The number one way to prevent nozzle plugging is to keep your label media in the plastic bags in which they shipped. Keeping your labels in the bags reduces the likelihood of foreign material from entering the printer. In addition, you should keep the work area with the printer relatively dust free. Don’t run an inkjet printer in a dusty environment. Also, it’s recommended that you keep the printer powered on at all times once you are printing regularly. For example, Memjet recommends their printers run 24/7. Also, don’t leave your printer powered off for a long period of time. Once powered off, the printer can no longer keep the nozzles from drying out. When left powered on, the printer will not consume much electricity since as it switches into an Energy Saving Mode. 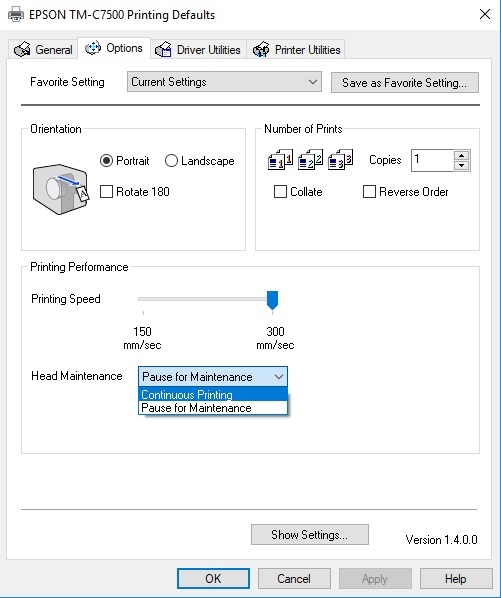 While in energy saving mode, the printer will still perform a limited number of maintenance routines. Should I worry about “Dry Climates?? With thousands of inkjet label printers sold and installed, we find these devices as the best current option; and we want to keep them working for you. We hope you find these recommendations of value. If you follow the above recommendations, you fewer problems, and have more uptime on your inkjet label printer.